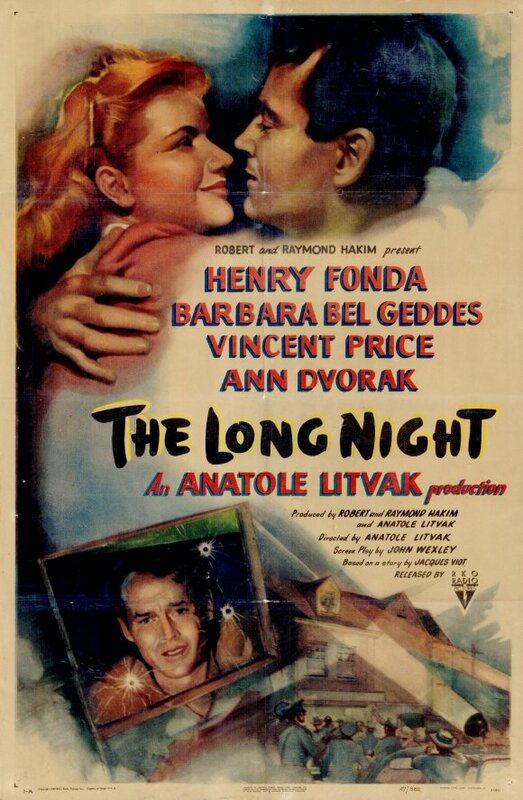 Anatole Litvak’s The Long Night is a remake of Marcel Carné’s 1939 drama Le Jour se lève. It stars Henry Fonda, Ann Dvorak, Vincent Price, and Barbara Bel Geddes in her screen debut. Litvak, who was born in Kiev, worked in the Soviet cinema system in Leningrad, in the pre-war film industry of Berlin, in France after Hitler’s rise to power, and finally in Hollywood, where he became a contract director for Warner Bros. in 1937. Litvak became an American citizen in 1940, enlisted in the Army, and worked with Frank Capra on his Why We Fight series of short films. Litvak finished the war with the rank of colonel and returned to directing Hollywood features. Two of his most famous films would follow — Sorry, Wrong Number (1948) and The Snake Pit (1948). Despite the happy ending, Litvak infuses The Long Night with a pervasive sense of doom. 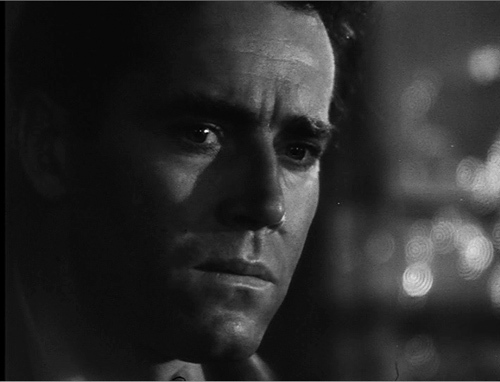 After shooting a man in his apartment building in an unnamed steel town somewhere near the Pennsylvania-Ohio state line, Joe Adams (Henry Fonda) sits alone in his rented room, the door barricaded as police and onlookers swarm the street below his window. Accompanied by a refrain from Beethoven’s 7th Symphony, Joe tells his story through flashbacks, and we learn what brought him to this desperate place. “How can I explain when I don’t understand myself?” he thinks to himself. Joe Adams grew up in an orphanage. “Class of ’34,” he tells the pretty young Jo Ann (Barbara Bel Geddes) when he meets her. (We must presume that Joe is younger than the man who plays him, since Fonda was 29 years old in 1934.) Jo Ann also came from the orphanage, and her romance with Joe is simple, childlike, and profound. Fonda plays Joe as a sweet-natured boy with no ability to plan long-term or handle disappointment or frustration. Bel Geddes plays Jo Ann in much the same way, but instead of being petulant she is naïve and unworldly, and open to the manipulation of a slimy magician named Maximilian the Great (Vincent Price). Maximilian is a congenital liar. His relationship with Jo Ann is nebulous for some time in the film. He first tells Joe that Jo Ann is his daughter, but that he had to go on the road for 15 years and leave her in the company of strangers. After another series of flashbacks, however, it becomes clear that Maximilian and Jo Ann were romantically involved. He took her to see the Cleveland Symphony when she had never been as far west as Pittsburgh, and forced himself on her when she had never been kissed. Jo Ann was uncomfortable with Maximilian’s actions, but she was also lonely, and Maximilian offered her a world of excitement and glamor. The visual style of The Long Night, its doomed protagonist buffeted by forces outside of his control, and its story told through flashbacks are all hallmarks of film noir, but it also has elements of social realism. For instance, Joe befriends Maximilian’s assistant Charlene (played by the always wonderful Ann Dvorak). He lies on her bed on a Sunday afternoon, reading the funnies, in her crummy room full of clutter, next to a couple of big bottles of beer and a bag of pretzels he brought for them to eat. She provides a stack of toast. She’s in the bath when he arrives, and throws on a slinky silk robe. It’s unclear how close Joe and Charlene really are, but the realism of the setting and the intimacy of the situation push the limits of Hays Code acceptability. Along with the realism and intimacy of some of the interior settings, there’s plenty of artifice in The Long Night. Unlike the typical Hollywood production in which backdrops were either matte paintings or rear-projection film, production designer Eugène Lourié used elaborate sets with tricks of forced perspective in The Long Night. For example, a factory on a hillside in the distance is really a small model that could be lit in whichever way the filmmakers wanted. Lourié and Litvak intended to achieve a kind of “poetic reality,” and they succeeded. At the same time, the artifice sometimes clashes with the realism, and when it does the film feels aimless. The Long Night was a commercial and critical failure, and lost approximately $1 million, but it was also the springboard for Barbara Bel Geddes’s long onscreen career. After seeing her performance in the film, RKO signed her to a seven-picture deal. Posted in 1947, May 1947 and tagged Anatole Litvak, Ann Dvorak, Barbara Bel Geddes, Charles McGraw, David Clarke, Davis Roberts, Dimitri Tiomkin, Drama, Elisha Cook Jr., Eugène Lourié, Film Noir, Henry Fonda, Howard Freeman, Jacques Viot, John Wexley, Moroni Olsen, Patty King, Queenie Smith, Raymond Hakim, RKO Radio Pictures, Robert Hakim, Robert Swink, Select Productions, Sol Polito, The Long Night, Vincent Price. Bookmark the permalink. Sounds like an interesting film. I’ve seen both “Sorry Wrong Number” and “The Snake Pit,” but I had never heard of this film. I’m going to have to see it now though.